Jaffa also called Japho, Joppa(transliteration from the Greek Ἰόππη) is the southern, oldest part of Tel Aviv-Jaffa (since 1950), an ancient port city in Israel. 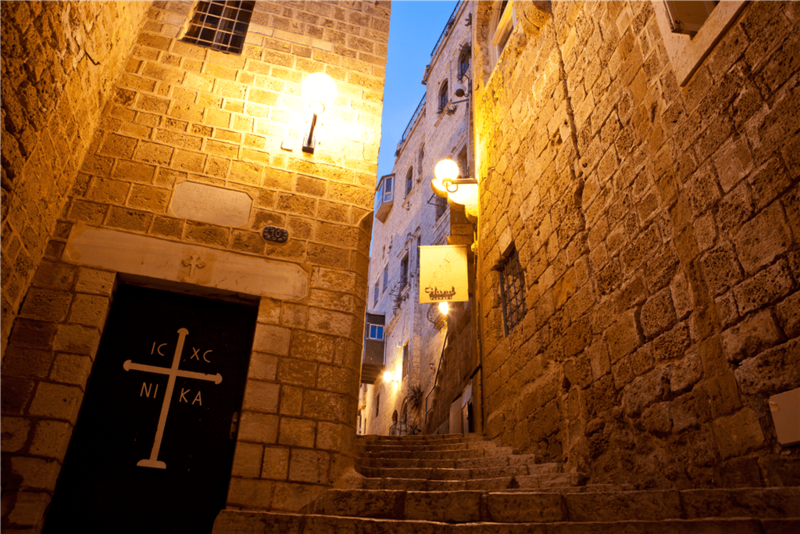 Jaffa is famous for its association with the biblical stories of Solomon, Jonah, and Saint Peter. 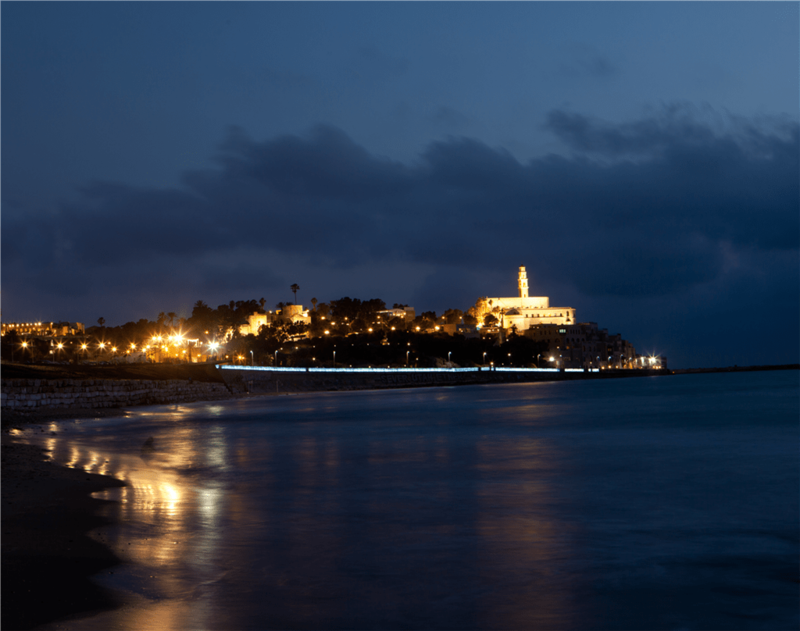 Tel Yafo (Jaffa Hill) rises to a height of 40 meters (130 feet) and it offers a commanding view of the coastline. Hence it had a strategic importance in military history. The accumulation of debris and landfill over the centuries made the hill even higher. Archaeological evidence shows that Jaffa was inhabited some 7,500 years BCE. 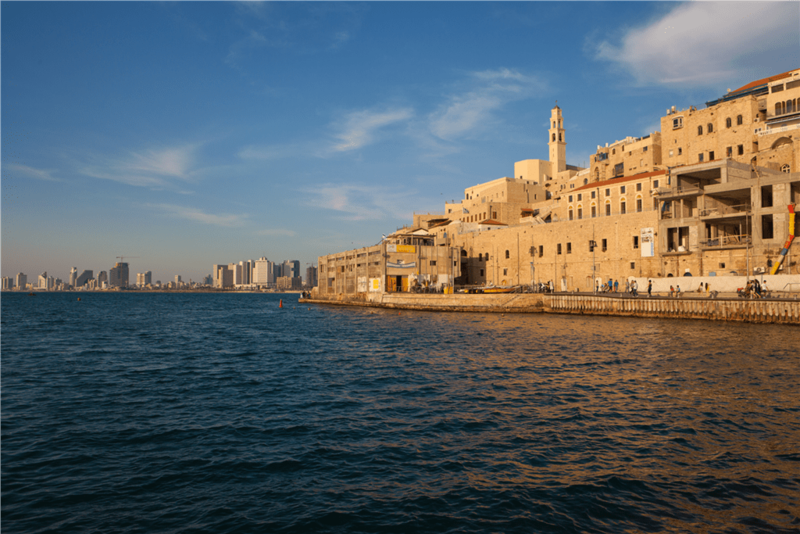 The natural harbor of Jaffa has been in use since the Bronze Age. Jaffa is mentioned in an Ancient Egyptian letter from 1440 BCE, glorifying its conquest by Pharaoh Thutmose III, whose general, Djehuty hid armed Egyptian warriors in large baskets and sent the baskets as a present to the Canaanite city’s governor. After Canaanite and Philistine dominion, King David and his son King Solomon conquered Jaffa and used its port to bring the cedars used in the construction of theFirst Temple from Tyre. The city remained in Jewish hands even after the split of the Kingdom of Israel. In 701 BCE, in the days of King Hezekiah , Sennacherib, king of Assyria, invaded the region from Jaffa. After a period of Babylonian occupation, under Persian rule, Jaffa was governed by Phoenicians from Tyre. Alexander the Great’s troops were stationed in Jaffa. It later became a Seleucid Hellenized port until it was taken over by the Maccabean rebels (1 Maccabees x.76, xiv.5) and the refounded Jewish kingdom. The New Testament account of St. Peter‘s resurrection of the widow Tabitha (Dorcas, Gr.) written in Acts 9:36–42 takes place in Jaffa, then called in Greek Ἰόππη (Ioppe, Latinized as Joppa. Acts 10:10–23 relates that, while Peter was in Jaffa, he had a vision of a large sheet filled with “clean” and “unclean” animals being lowered from heaven, together with a message from the Holy Spirit to accompany several messengers to Cornelius in Caesaria. In 636 Jaffa was conquered by Arabs. Under Islamic rule, it served as a port of Ramla, then the provincial capital. 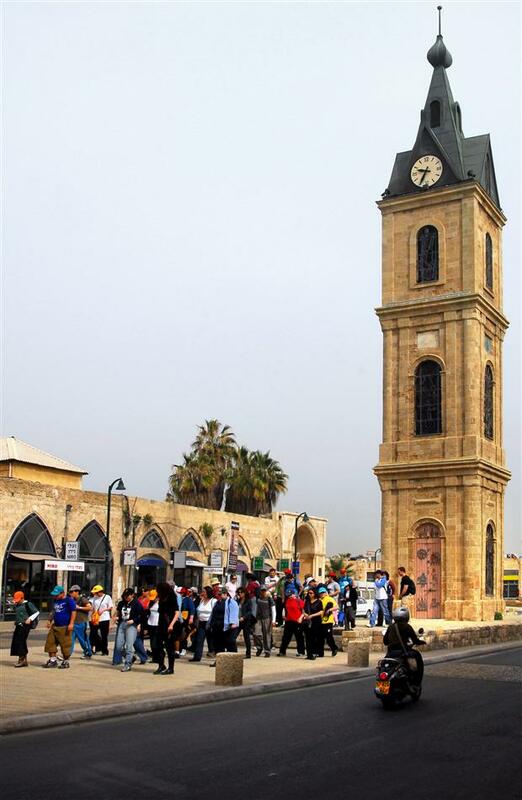 Jaffa was captured in 1100 after the First Crusade, and was the centre of the County of Jaffa and Ascalon, one of the vassals of the Kingdom of Jerusalem. One of its counts, John of Ibelin, wrote the principal book of the Assizes of the Kingdom of Jerusalem. During the period of the Crusades, the Jewish traveller Benjamin of Tudela (1170) sojourned at Jaffa, and found there just one Jew, a dyer by trade. Saladin conquered Jaffa in 1187. The city surrendered to King Richard the Lionheart on 10 September 1191, three days after the Battle of Arsuf. Despite efforts by Saladin to reoccupy the city in July 1192 (Battle of Jaffa) the city remained in the hands of the Crusaders. On 2 September 1192, the Treaty of Jaffa was formally signed, guaranteeing a three-year truce between the two armies. Frederick II fortified the castle of Jaffa and had two inscriptions carved into city wall, one Latin and the other Arabic. The inscription, deciphered in 2011, describes him as the “Holy Roman Emperor” and bears the date “1229 of the Incarnation of our Lord Jesus the Messiah.” In 1268, Jaffa was conquered by Egyptian Mamluks, led by Baibars. In the 14th century, the city was completely destroyed for fear of new crusades. According to the traveler Cotwyk, Jaffa was a heap of ruins at the end of the 16th century. In 1515, Jaffa was conquered by the Ottoman Sultan Selim I. The seventeenth century saw the beginning of the re-establishment of churches and hostels for Christian pilgrims en route to Jerusalem and the Galilee. During the eighteenth century the coastline around Jaffa was often besieged by pirates and this led to the inhabitants relocating toRamleh and Lydda where they relied on messages from a solitary guard house to inform them when ships were approaching the harbour. The landing of goods and passengers was notoriously difficult and dangerous. Until well into the twentieth century, ships had to rely on teams of oarsmen to bring their cargo ashore. Many more died in an epidemic of bubonic plague that broke out soon afterwards. The governor who was appointed after these devastating events, Muhammad Abu-Nabbut, commenced wide-ranging building and restoration work in Jaffa, including the Mahmoudiya Mosque and Sabil Abu Nabbut. During the 1834 Arab revolt in Palestine, Jaffa was besieged for forty days by “mountaineers” in revolt against Ibrahim Pasha. Residential life in the city was reestablished in the early nineteenth century. In 1820 Isaiah Ajiman of Istanbul built a synagogue and hostel for the accommodation of Jews on their way to the holy cities of Jerusalem, Hebron, Tiberias and Safed. This area became known as Dar al-Yehud (Arabic for “the house of the Jew”); and was the basis of the Jewish community in Jaffa. The appointment of Mahmud Aja as Ottoman governor marked the beginning of a period of stability and growth for the city, interrupted by the 1832 conquest of the city by Muhammed Ali of Egypt. By 1839, at least 153 Sephardi Jews were living in Jaffa. The community was served for fifty years by Rabbi Yehuda HaLevi of Ragusa. In the early 1850s, Rabbi HaLevi leased an orchard to Clorinda Minor, founder of a Christian messianic community that established Mount Hope, a farming initiative to encourage Jewish refugees to learn manual trades. In 1855, the British Jewish philanthropist Moses Montefiore bought the orchard from HaLevi, although Minor continued to manage it. By the beginning of the twentieth century, the population of Jaffa had swelled considerably. A group of Jews left Jaffa for the sand dunes to the north, where in 1909 they held a lottery to divide the lots acquired earlier. The settlement was known at first as Ahuzat Bayit, but an assembly of its residents changed its name to Tel Aviv on 21 May 1910. Other Jewish suburbs to Jaffa were founded at about the same time. In 1904, Rabbi Abraham Isaac Kook (1864–1935) moved to Palestine and took up the position of chief rabbi of Jaffa. In 1917, the Ottoman authorities expelled the entire civilian population. While the Muslim evacuees were allowed to return before long, the Jewish evacuees remained in camps (and some in Egypt) until after the British conquest. Tagged Center, coastline, jaffa, tel aviv.